All things considered, after a long, hot, and wet summer, Monday was pretty nice. We had ample sunshine, highs in the upper 80s, and some drier weather. It offered an all-too-brief taste of what is eventually coming—fall, which may arrive toward the end of the first week of October. But now it’s over and we’re headed back into a wet and humid period for awhile. We’re not too concerned about the potential for flooding this week, but the dreary quotient for the next several days will be pretty high. As Gulf moisture resumes flowing into the region today, rain showers will also spread over the area. I’d peg rain chances at about 50 percent today, with mostly cloudy skies and highs in the upper 80s. Fairly quick movements of storms should limit any concerns about heavy rainfall lasting too long. The midweek is … interesting. As a cold front approaches the area from the northwest, rain will probably spread throughout much of the region on Wednesday. It’s not clear whether the front itself will reach into Houston, or stall just before or after pushing into the region. If you’re lucky (and if you’re on the west side of the city), you may see a day or so of drier weather on Thursday. But it’s not something I’d count on. Basically, we can expect rainfall ahead of and along the front, and some brief drying after the front if it pushes through where you live. However, even if it does, the front will probably pull back (westward) across the region on Friday. Highs in the mid- to upper-80s. 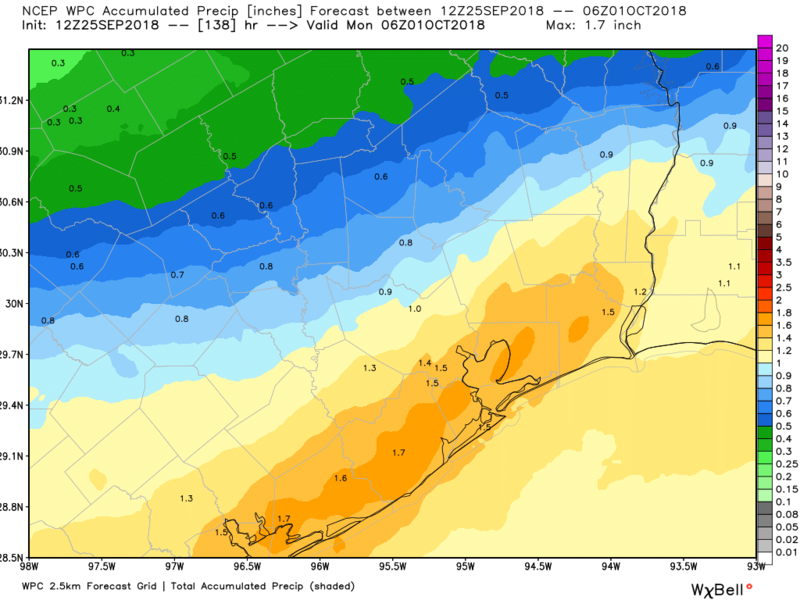 Given all of that, it is with a bit of hand-waving that we predict about 50 percent rain chances on Friday as the front moves back across the region and away from Houston. Highs in the upper 80s. 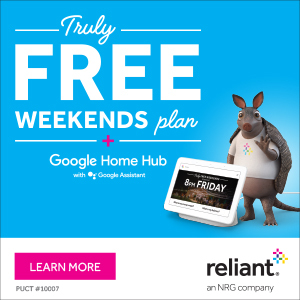 So what to expect for the weekend? As of now, it appears as though some slightly higher pressure will move over the area from the east. This could (he wrote, optimistically) push rain chances back down a wee bit for Saturday and Sunday, but I think we’re still looking at partly to mostly cloudy days, with 30 to 50 percent rain possibilities each day. The glass-half-full way to look at the forecast is that the gloomy skies should limit high temperatures to the mid- to upper-80s. Early next week should see more of the same. Our first real cold front now seems unlikely before around the October 5th time frame, or a week from this Friday. Tomorrow, we’ll take a deeper look into when we think (hope) our first real strong front of the fall season will push through Houston. Always a true pleasure to get the “non” hype weather, most excellent!! I wish I could take more pleasure in this weather … but I suppose it could be worse. …and there are no hurricanes in the gulf. I know it’s glum and gloomy (though Sunday and Monday were really nice days). Hate to say it, but I’ll take the rain (in manageable amounts) over a drought that kills all the trees in Memorial Park any day of the week. An old water boss once told me “the day it stops raining is the first day of the next drought”. Now, this cool front you speak of…ha ha ha. I assume it will just be a tease, but I’ll take it nonetheless. 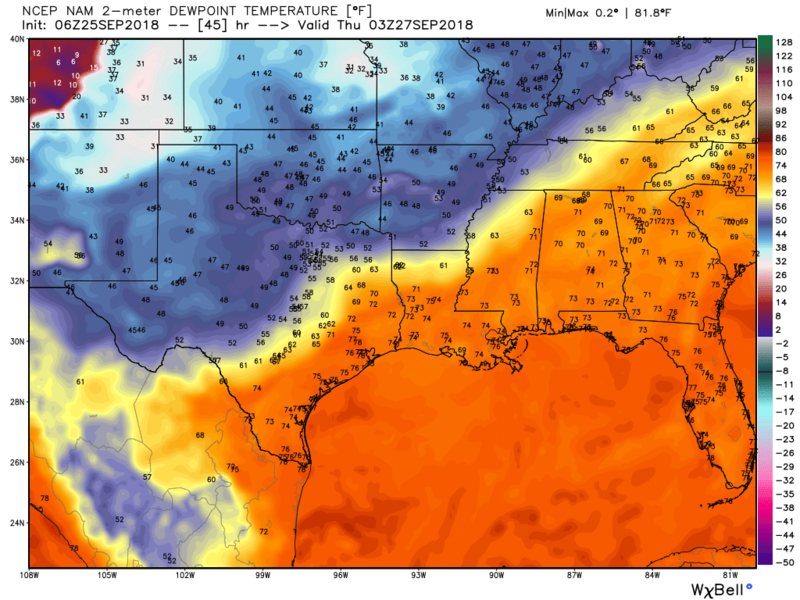 That first real cool front just keeps pushing back, and back, and back…IIRC at first there was a chance the weekend of the 22nd, then it was maybe the 29th, then maybe that next Monday/Tuesday, and now it’s the end of the week. Just doesn’t seem to want to get here this year.